What are the advantages and disadvantages of a PPC campaign? Starting a PPC campaign allows you to show up in the Google search results for search terms that you may not rank for organically. A PPC campaign allows you to set daily and monthly budgets for the keywords and areas you want to target. If you are selling a product or service that is sold out or fully booked, you can allocate your budget to a different product or service with a simple click. You also have more control over the locations where your ads show. With SEO, you are building overall site authority, and while you may be targeting specific geo-modified keywords, you could potentially rank in other locations. With paid search, you can set your preferred locations as well as the exact geo-modified keywords you want to target. One of the main benefits of a paid search campaign is that results can be instantaneous. While it typically takes 30-60 days to fully optimize a campaign to see optimal results, you can begin receiving leads or making sales the first day your ads are live. Will paid search marketing ads still help me if I rank in the first position organically? The answer to this is, of course, “YES!” — but let me tell you why. For terms that you do rank for organically, having a paid ad allows you to claim more “real estate” on the search engine results page and increases the likelihood that people will come to your site. People tend to believe your site is more authoritative because Google allows you to show up more than once on the page. According to Search Engine Watch, 34 percent of paid search clicks occur when the same website ranks organically on the page. If the paid search ad is paused, only 11 percent of the traffic generated by the ads will be replaced by the organic clicks. Having a paid search campaign gives you the ability to control your message through your ad copy and change it easily and often if necessary. You can create unique ads for specials and seasonal offerings and have them rank in top positions quickly. This allows your ads to always be relevant. 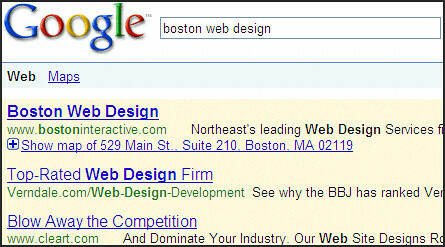 PPC also gives you the ability to control the message and content of the landing page to which you send your visitors. You can optimize this landing page for conversions and sales, with less focus on keyword-related content. Finally, you have the ability to test ad content, landing pages and keywords on a larger scale. You can determine which calls to action are driving traffic and which keywords convert the best in a shorter time frame. Then, you can apply this knowledge to your SEO campaign. Side Note: Running a paid search campaign will NOT improve your organic rankings. Should I start a PPC campaign until I start ranking organically? You should most certainly start a PPC campaign immediately. However, see the question above for why you should continue the campaign even if you rank in the first position organically. Why should I pay for people to click on my website when they are looking for my brand? Besides the points mentioned above, there are many reasons to bid on branded keywords. Competitors may be bidding on your branded terms and you will want to ensure you are showing in the top position for your brand. Branded clicks are very inexpensive, as you are going to be the most relevant result for your brand, and Google will “reward” you for that. People searching for your brand are more likely to convert, and you want to be where they are searching. How will this help my business, and what should I expect for an ROI? Search Influence tracks all aspects of a paid search campaign, similar to how we track success for SEO. We provide call tracking numbers for campaigns and set up form tracking to attribute leads directly to paid search campaigns. Our monthly reports include a list of leads, cost per lead, clicks, click through rates, and average cost per click (among other factors). This helps our clients determine if the leads we provide are valuable and what leads are becoming actual customers. ROI will vary depending on industry, but we strive to provide a positive ROI for every client. So if you are wondering if you should start a paid search campaign, the answer is almost certainly “Yes!” With effective research, targeting and analysis, you can have a successful campaign that will generate leads and sales for your business. I’d love to hear your opinions on PPC, so leave a comment below!